Peter J. Mikulecky, PhD and Kate Brutlag teach Math and Science at Fusion Learning Center/Fusion Academy in Solana Beach, CA. Michelle Rose Gilman is the Founder of Fusion Learning Center. Members of this team have authored AP Biology For Dummies, ACT For Dummies, Pre-Calculus For Dummies, Chemistry Workbook For Dummies and GRE For Dummies. Part I: Thriving Inside the Test Tube: How to Prepare for the Exam. 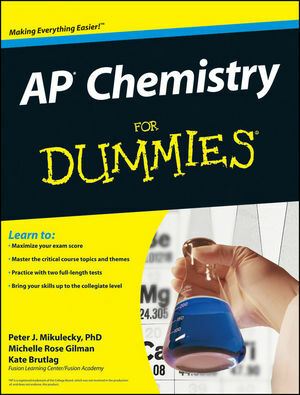 Chapter 1: Knowing What You’re Up Against: The AP Chemistry Exam. Chapter 2: Preparing Yourself for the Exam. Part II: Building Matter from the Ground Up: Atoms and Bonding. Chapter 3: Looking Under the Atomic Hood: Atomic Structure. Chapter 4: Answering Questions about Atomic Structure. Chapter 5: Working and Playing Together: Bonding. Chapter 6: Answering Questions on Bonding. Chapter 7: Doing Atomic Geometry: Molecular Shapes. Chapter 8: Answering Questions on Molecular Shapes. Part III: Colliding Particles to Produce States. Chapter 9: Putting a Finger to the Wind: Gases. Chapter 10: Answering Questions on Gases. Chapter 11: Condensing Particles: Solids, Liquids, and Solutions. Chapter 12: Answering Questions on Solids, Liquids, and Solutions. Part IV: Transforming Matter in Reactions. Chapter 13: Reacting by the Numbers: Reactions and Stoichiometry. Chapter 14: Answering Questions on Reactions and Stoichiometry. Chapter 15: Going Nowhere: Equilibrium. Chapter 16: Answering Questions on Equilibrium. Chapter 17: Giving and Taking in Solution: Acids and Bases. Chapter 18: Answering Questions on Acids and Bases. Chapter 19: Transferring Charge: Oxidation-Reduction. Chapter 20: Answering Questions on Oxidation-Reduction. Chapter 21: Knowing Speed from Spontaneity: Kinetics and Thermodynamics. Chapter 22: Answering Questions on Kinetics and Thermodynamics. Part V: Describing Patterns and Predicting Properties. Chapter 23: Knowing Chemistry When You See It: Descriptive Chemistry. Chapter 24: Answering Questions on Descriptive Chemistry. Chapter 25: Living with Carbon: Organic Chemistry. Chapter 26: Answering Questions on Organic Chemistry. Part VI: Getting Wet and Dirty: Labs. Chapter 27: Knowing Your Way around the Lab: Equipment and Procedures. Chapter 28: Taking the Tour: Recommended AP Experiments. Part VII: Measuring Yields: Practice Tests. Chapter 29: Practice Test One. Chapter 30: Practice Test Two. Chapter 31: Ten Math Skills to Bring with You to the Exam. Chapter 32: Ten Critical Types of Chemistry Problems. Chapter 33: Ten Annoying Exceptions to Chemistry Rules.